The Cosmic Form - Dr. A.V. Lakshminarasimham, M.Sc., Ph.D.
Dr. A.V. Lakshminarasimham, M.Sc., Ph.D. The concept of Brahman, the Ultimate Conscious Reality, manifesting itself as the Universe, and Its being the material and the efficient cause for creation, represents the pinnacle of philosophical quest. Yet, the cognition of the truth of the Immanence of Brahman is difficult to achieve, for it is impossible for man to rend the veil of Avidya or Maya. Such understanding of Brahman comes best to man when the Lord vouchsafes 'Viswavirataswaroopa Darsana' to the ardent seeker - not by jaded disquisition of self-designated philosophers. During the Summer Course on Indian Culture and Spiritually held in 1974 at Brindavan, Bhagawan had been discoursing on "Brahman" and other related topics with remarkable clarity and lucidity, quite characteristic of Bhagawan's expositions on any subject. One day, He walked up to me and asked me, "Have you been able to follow the discourses?" "Yes, Swami! They are so nice," I replied immediately. He then said, "you shall see something more" and walked past to the waiting congregation. During the early hours of the next morning, around 3 A.M., I was awake to a unique and astounding experience. In the open where I slept Baba appeared in a magnificent, glorious, gigantic form, sitting in the lotus posture, 'padmasan' on the ground. I was standing before him and I could see the width of His knee, in that splendorous form, exceed my own height. I had to lift my head up a considerable angle to look at Baba's face, resplendent and beautiful, with matted locks of hair of luminescent copper-brown hue. To the right Lord Ganesha was sitting, while on the left Lord Subramanya was standing. Baba said "Behold!" and I looked into His eyes and later fixed my gaze on His Chest. Lo! In Him, vast space teeming with millions of stars, many of them being formed and fading out then, the planets and their moons whirling past, the earth with its variety of flora and fauna, forests deserts, oceans, mountain ranges, industrial workshops, railway lines, sky scrapers, airplanes and all things that are found on this tiny little earth. The whole Universe in Him! My body became warm at this marvelous, awesome, wondrous experience. What a majestic, glorious, Cosmic Form! Immediately thereafter, Baba diminished in size, to His normal height, and appeared as an ethereal, enchanting Form glowing with bluish luminosity. This is Sai as Vishnu, I felt. 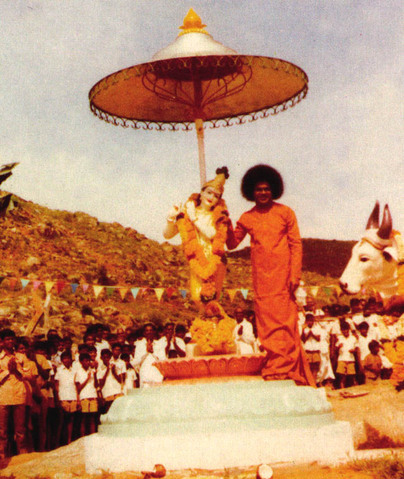 The two visions I had the good fortune to have as described above clearly demonstrate the Immanence of Brahman in the Universe and also that our Lord Sri Sathya Sai is none else than that Supreme Being who is the Lord of the Universe.